Traveling to the Holy Land can be a life changing experience. Few things can compare with walking beneath the pillars of an ancient street, or on the stone-paved streets of the city of Jerusalem, or admiring the intricate mosaics of the palace of Caesarea. Yet few people have the chance to visit the Holy Land because of the high cost, physical demands, and time involved. What if many of the sights, sounds, and experiences could be brought home? What if everyone could at least gain a glimpse of this wonderful and significant place? With the Museum of Biblical Antiquities, that lofty goal can be achieved. Visitors would not only learn more about the history of the Bible and its people, but also would be able to experience and feel what it might have been like to live over 2000 years ago, all in an interactive, state-of-the art museum. 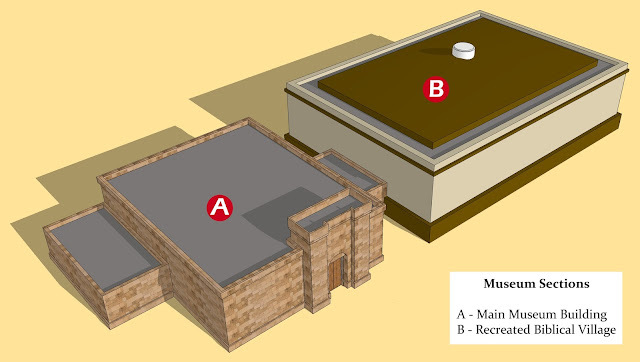 The Museum of Biblical Antiquities would be divided into two main sections; the actual museum, and the recreated biblical village. The main museum building would be a center for learning and would be designed for many different uses. The main floor would include a small theater, gift shop, and both permanent and changing exhibits. Exhibits would include everything from ancient daily life, warfare, to temple worship. Artifacts, replicas, models, and interactive displays would fill the exhibits. The second floor would contain classrooms, offices, additional exhibit space for an art gallery, and a kids' crafts room where children could make papyrus, create cuneiform tablets, and excavate in an archaeology dig site. The recreated biblical village would be a place for hands-on, interactive learning, where visitors could roam through the streets of a first century village and haggle with a street vendor, watch a carpenter at work, observe a woman working on a loom, grind wheat, kneed and bake bread, weave a hand-woven basket, and learn how to make olive oil by crushing and pressing the freshly harvested olives. At the heart of the village would be a first century synagogue built of limestone pillars, stucco covered stonewalls, and a wood-beam roof. The synagogue would include several rows of stone seats surrounding the main room, a storage room for Torah scrolls, and a mikvah for ritual cleansing. The village would also include several homes and shops of different sizes and styles. The largest home, or landowner's home, would contain spacious living and sleeping quarters, and a banquet room used for feasts and weddings. The village square would be surrounded by the landowner's home, the synagogue, the olive oil press building, and the village market. Further from the village square would be located several peasant homes and shops, including the carpenter, potter, tanner, and metal working shops. Visitors could also watch as workers build new homes and shops the same way these buildings were built 2000 years ago. Outside of the village would be a small farm area that would include a sheepfold, watchtower, barn, threshing floor, and fields of wheat and barley. The Museum of Biblical Antiquities would be like no other museum in the world, and would be designed to help people truly experience and understand history and the scriptures as never before. If you are interested in helping this incredible museum come to life, either through expertise or financial support, please contact me.